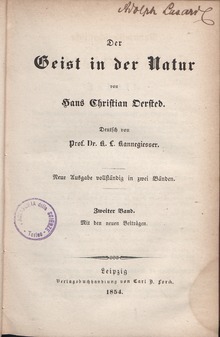 Ioannes Christianus Ørsted (natus Rutcopiae die 14 Augusti 1777 – mortuus est Hafniae die 9 Martii 1851) fuit chemicus et physicus Danicus qui physicae electromagneticae peritus. Etiam a philosophia Kantii inspiratus est. Ole Immanuel Franksen: Hans Christian Ørsted - A man of two cultures. Strandberg Edition, Birkerød 1981, ISBN 87-87200-43-0. Rolf Lindborg: Anden i naturen. Naturfilosofen Hans Christian Ørsted, experimentalfysiker. Nya Dox, Nora 1998, ISBN 91-578-0032-4. Novissima mutatio die 14 Augusti 2015 hora 10:17 facta.